It has been very surreal in New York today. The subways and streets are filled with people dressed as Santa. Some have just donned a hat, others have added a beard and full fur trimmed outfit. There have been some liberal interpretations of what a Mrs Claus might look like and quite frankly if many of these wanna be female Santas were working in the North Pole for real, they would freeze to death! And the reason for all this merriment? Well today is New York’s annual Santacon. This is basically a pub crawl through Midtown Manhattan in fancy dress. It’s funny how seeing them on the subway on the way out for lunch in Korea Town it seemed quite odd but by the time you’ve seen a hundred of them, it all seems quite normal. My favourite Santa was hanging out on the platform at 59th Street. He/She was wearing an outfit that showed Santa’s muscles, bare arms, bare torso and bare legs, just wearing Santa red shorts. Coupled with white wig, beard and glasses, the only hint it might have been a girl under it all was the purple nails, but even then I couldn’t be sure. Kind of like a Marvel style Santa, with special powers to visit every house in the world in one night. Maybe. Such a shame I didn’t get a photo to share here. 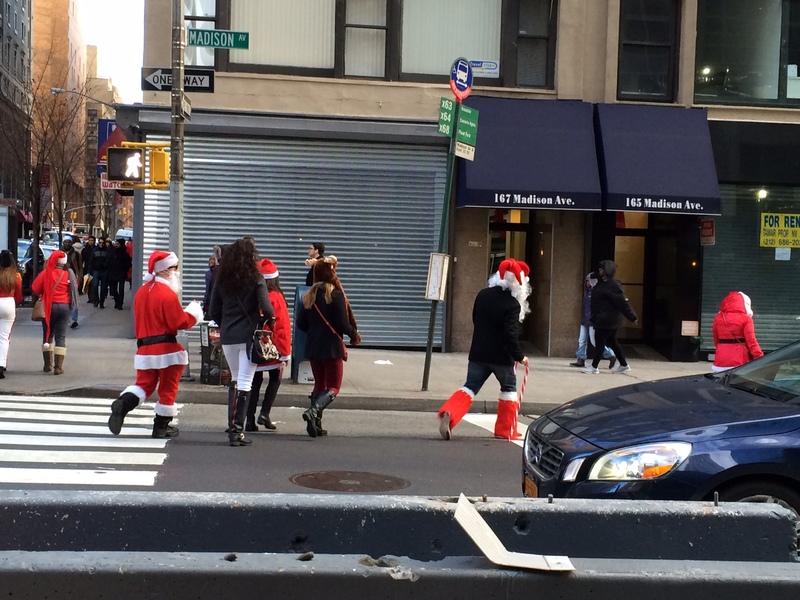 Categories: Christmas | Tags: fancy dress, NYC Santacon, Santa | Permalink.